I know what you are thinking - Mayonnaise in a cake?!?!? I know, I know. Chicken Legs thought the same thing until he took a bite. Then we was like mayonnaise in a cake! YES!!! When you think about it, it makes sense that this would be good. Mayonnaise is just eggs and oil. Eggs and oil definitely go in cakes, so why not mayonnaise?!?!? 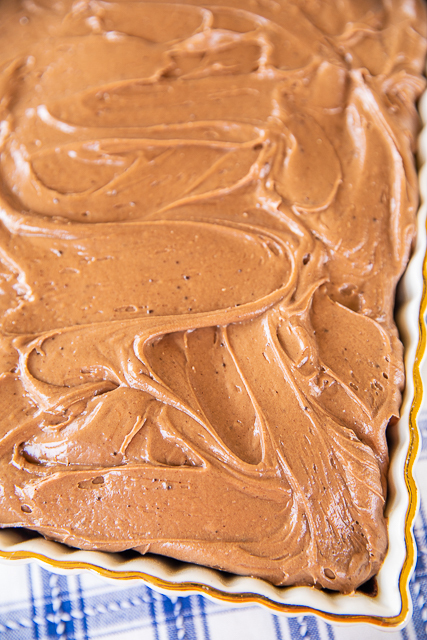 This cake is super moist and crazy delicious. 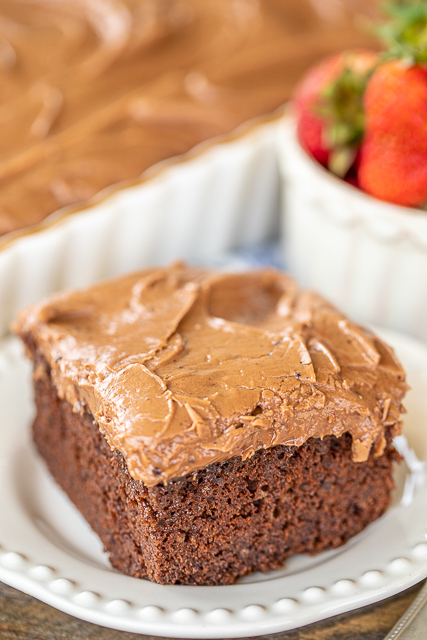 The chocolate cream cheese frosting really puts this cake over the top! We like to serve it slightly warm with a scoop of vanilla ice cream. Chicken Legs has done extensive testing on warming cake, and he has concluded that nine seconds is the perfect time to microwave the cake. That gets the cake warm but not warm enough for the frosting to start melting. 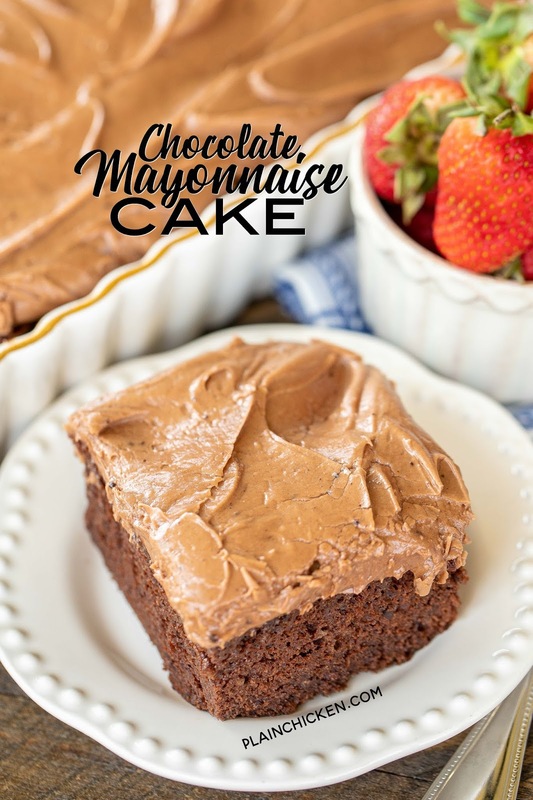 This Chocolate Mayonnaise Cake is great for potlucks, tailgating, the upcoming holidays or a Thursday! 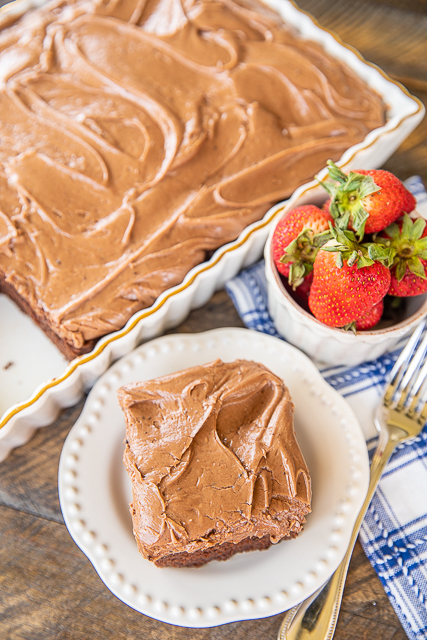 Give this a try the next time you have a chocolate craving. I promise you won't be disappointed!! Combine flour, cocoa powder, baking soda, salt and baking powder. Set aside. Beat eggs, brown sugar, and vanilla at medium-high speed with a heavy-duty electric stand mixer about 3 minutes. Add mayonnaise, and beat at low speed until combined. Add flour mixture to egg mixture alternately with hot water, beginning and ending with flour mixture. Beat at low speed just until blended after each addition. Bake at 350° for 30 to 35 minutes or until a wooden pick inserted in center comes out clean. Cool completely on a wire rack (about 1 hour). Beat together cream cheese, butter and vanilla at medium speed with an electric mixer until creamy. Gradually add powdered sugar and cocoa powder to butter mixture, alternately with heavy cream. Beat at low speed until blended. Increase mixer speed to medium, and beat 1 to 2 minutes or until light and fluffy. Spread frosting on cooled cake. 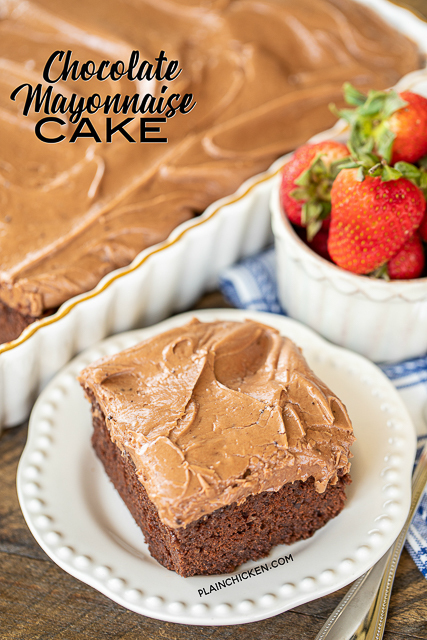 My mother made this cake when I was a child and I am now 64 years old.It really is a nice moist cake.After all ,mayonnaise is made from eggs and oil.I have made this a few times over the years but forgot what a great recipe this is.Thank you for bringing back great cake memories. This was always my request for a birthday cake when I was growing up and I'm 69 now. About the only difference in your recipe and hers is that she used cold left over coffee instead of water. This cake is so good sometimes we didn't even wait for her to frost it! Like Nana said, thanks for the memory! Great tip on the microwave time on the cake -- I always get that a little off. This cake looks amazing, but that is the richest and swirliest (not sure if that's a word, lol) frosting I have ever seen! Yum! It was the only cake we had as children, didn't know of any other kind. Still make it today for my children who just love it. It is still more moist than any cake I've ever had!